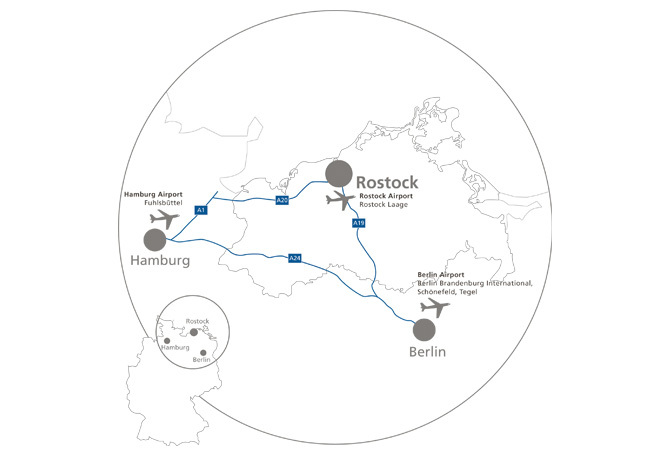 To reach Rostock from Berlin, head north or south out of the city to the A10. Follow it northwest to the A24, which leads straight into the A19 running directly north to Rostock (2,5 hours). There are frequent direct trains to Rostock from Berlin and hourly services from Hamburg. Find your connection here www.deutschebahn.com. Attention! the rail between Berlin and Rostock is under construction. The train takes between 2,5h up to 5h to reach Rostock. There are ferry services to Denmark, Sweden and Latvia, as well as to Estonia and Finland in summer. Fares are quite complicated depending on the season and the number of people travelling, so the following are provided as rough high-season guides only. travels to Gedser, Denmark, Trelleborg in Sweden and Ventspils, Latvia. Boats arrive and depart from the overseas seaport (Überseehafen), which is on the east side of the river Warnow. There is an S-Bahn from Seehafen to Rostock main station, but it’s a 20-minute walk from the station to the piers. has a sparse number of scheduled services to and from Cologne-Bonn, Dortmund, Munich and Zürich, plus different charter flights. We will offer a shuttle bus service, please contact the conference organizer.